The top United Nations envoy to the Democratic Republic of the Congo (DRC) has stressed that diplomacy – and not military action – is the only solution to the fighting that has engulfed the volatile far east of the country, as the UN humanitarian wing voiced concern over the impact of the latest violence on civilians. Fighting resumed in North Kivu province on Saturday evening between Government forces (FARDC) and the militia known as the National Congress for the Defence of the People (CNDP), led by former general Laurent Nkunda. MONUC is intervening to thwart the CNDP’s attempt to attack the province’s capital Goma and other population centres, according to Alan Doss, the Secretary-General’s Special Representative. Acting under its mandate to support FARDC in defending civilians, the UN mission has opened fire and used helicopters on CNDP positions, he said today, speaking to reporters in New York via videolink from the DRC. There have been incidents of protesters throwing stones against UN property as well an attempt to get into a MONUC base, he said. Shots were fired into the air and he expressed his deep regret that this resulted in one death. “Every time that happens we explain to the population that you are in fact slowing our efforts and impeding our efforts,” the official said, calling on the Government to assist in sensitizing the population to the blue helmets’ mandate. Tonight the Security Council strongly condemned the resurgence in fighting and its impact on the civilian population and urged all parties to agree to an immediate ceasefire. In a press statement read out by Ambassador Zhang Yesui of China, which holds the rotating presidency this month, Council members also called on all sides to adhere to their commitments under two peace accords – one reached in Goma near the start of the year and the other in Nairobi in late 2007 – that were supposed to end the fighting. As many as 250,000 Congolese have been made homeless since August because of the violence, and the UN Office for the Coordination of Humanitarian Affairs (OCHA) said that internally displaced persons (IDPs) in North Kivu number around 850,000, stressing that a constantly-evolving situation means that these figures are only estimates. Fluctuating “difficult” circumstances on the ground also mean that MONUC must constantly take action to prevent further attacks on civilian areas and protect aid workers and UN staff, the Representative said. The majority of the 17,000 MONUC forces in the vast country are stationed in the volatile east, but in North Kivu province, which borders Rwanda and Uganda, “we have about just a little less than 6,000” troops, he noted. But boosting the number of blue helmets is not enough to resolve the problems in the region, the official said, calling for increased capacity on the ground, including special operations, and for greater peace support. Shelter, food, water and sanitation, health and protection are the key needs identified by OCHA, which, along with the UN Children’s Fund (UNICEF), has launched rapid response measures to address immediate needs. Meanwhile, the UN World Food Programme (WFP) is monitoring the situation regarding the need for food. The UN refugee agency said it is struggling to prepare for the arrival in Goma of some 30,000 IDPs forced to flee recent heavy fighting. To get ready for a possible influx of the IDPs, a team from the UN High Commissioner for Refugees (UNHCR) travelled yesterday to Kibati camp, north of Goma, which already shelters 15,000 others. 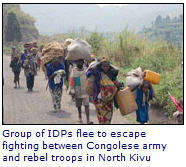 Tens of thousands are believed to be escaping southward from conflict, according to agency spokesperson Ron Redmond. “Many more could be on the way from areas further north that have been affected by the fighting in recent days,” he told reporters, with fighting reported near Rutshuru, 100 kilometres north of Goma, where another UNHCR office is situated. In the capital, agency staff characterized the situation as tense after demonstrations on Sunday reportedly left five people dead. Yesterday, in a statement issued by his spokesperson, Secretary-General Ban Ki-moon expressed his deep concern at the deteriorating security situation in the DRC’s far east, where rebels have fired rockets at UN peacekeepers.